A new study has found that buffered bike lanes are better than conventional bike lanes when it comes to encouraging bicyclists to ride outside the door zone. The study draws its conclusion, in part, based on a test done with bike lanes in Chicago. 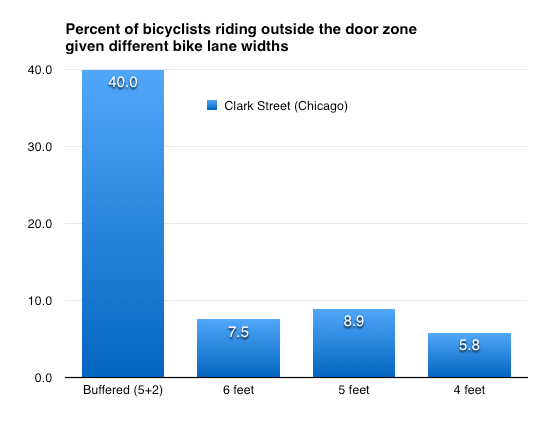 Bicyclists are more likely to ride outside the door zone in a buffered bike lane than in any other bike lane width studied. That’s because the door zone is four feet wide, and riding in the center of a six-foot-wide bike lane still doesn’t give a cyclist enough clearance. The Chicago Bike Map itself recommends riding four feet away from parked cars, well outside the center line of even a six-foot-wide lane. The on-street tests demonstrated that a six-foot-wide bike lane offers no advantage over one that’s five feet wide, or even four feet wide. Regardless of the width, bicyclists still ride in the center of the lane — within the radius of a typical car door swinging open. Dooring crashes are common in urban areas like Chicago: In 2012, the last year for which data is available, 18 percent of reported bike crashes were doorings. Chicago has several six-foot-wide bike lanes, including those on Elston from North Avenue into the far northwest side, Division Street through Wicker Park, and Milwaukee between Division and Elston. The on-road test, using temporary bike lane stripes, took place on Division Street near California, and on Clark Street near Schiller. Both streets did not have bike lanes before, and then bike lanes of varying widths were installed, culminating in the buffered lanes that exist at those locations today. 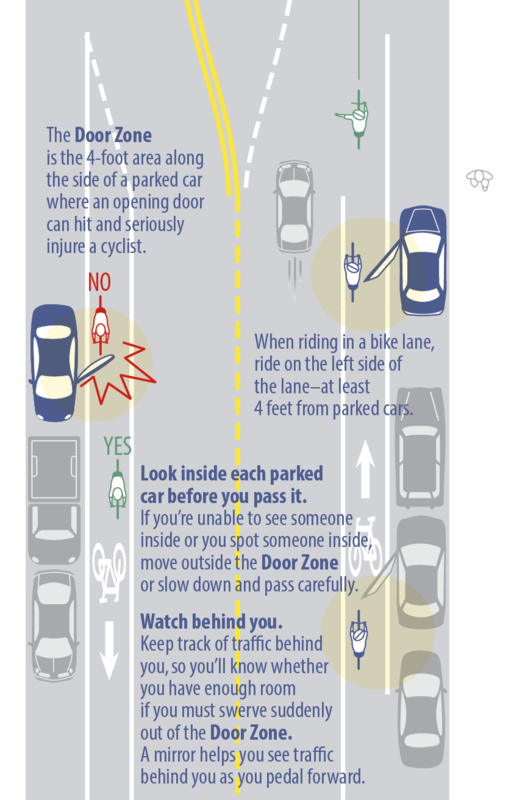 The 2014 Chicago Bike Map advises bicyclists of door zone dangers, and advises riding far away. The researchers were studying different types of bike lanes, and how people use them, in order to refine recommendations in the American Association of State Highway and Transportation Officials’ “Guide for the Development of Bicycle Facilities.” The guide recommends five-foot-wide bike lanes and says four-foot-wide bike lanes can be used in other situations — but it was based on trial and error, not scientific research. While protected bike lanes weren’t studied in this research, the authors’ observations show how proximity to moving traffic contributes to doorings. For instance, the study concluded that, “as traffic volume increases, bicyclists move away from vehicles in the travel lane and position themselves closer to parked vehicles or the curb.” Researchers observed the same response as truck traffic increased in the travel lane. This puts bicyclists in the door zone — but with protected lanes, cyclists don’t have to ride next to motor vehicle traffic, and this isn’t a problem. Chicago has been installing protected and buffered bike lanes across the city, and adding buffers to many conventional lanes. Those conversions are especially needed in locations where well-used conventional bike lanes have faded away, like along Division Street through Wicker Park and 18th Street through Pilsen. Whether those original bike lanes were six or five feet wide, their vanished lane markings now provide bicyclists with zero clues about how to keep comfortably away from moving traffic and outside the door zone. This modified bike lane on one block of Division Street was part of a study to observe how bicyclists position themselves. Lawrence from Western past Jeff Park is almost completely worn off too. Why not put the bike lane inside of the parking lane? My only question/comment is, once Chicago uses up all its federal grant money, will the city have the money to repaint the lines every two years at minimum? I’d love to see the requisite amount set aside in a budget line-item on a yearly basis, for maintaining all the stripes that CDOT has in their database as being supposed to be on the pavement. Of course bike lanes are the most obvious part of the problem, but there are certain sections of street (like the Cicero bridge over 290, for years) where the ordinary yellow and white lane markers are so worn off as to be invisible, which leads people who don’t drive that section of road regularly to get confused and weave and generally cause confusion and disorder. These unfunded liabilities are what Strong Towns’s Chuck Marohn, self-proclaimed Republican civil engineer from rural/suburban Minnesota, rails against. In no way am I advocating building less stuff – I’m advocating for changing the city and state budgets around so that more of one thing is built (infrastructure for efficient transportation) and less of another (wider roads). Half the city’s bike lanes, and sharrows, are worn off, I feel. That’s what a protected bike lane is and it’s not always possible to do this because of local opposition, a state-imposed ban on state jurisdiction roads, or opposition to removing parking to make space for a protected bike lane (which needs 1-2 feet more space than a buffered bike lane, on each side of the street). No one ever mentions that Rear-View Mirrors for Bicycles are available now. Unlike thirty years ago. Well, they had rear view mirrors, but unless the mirror is out past the end of the handlebar, you only see your own trousers. The New Mirrors use a Velcro™ strap, so the mirror can be removed if you need to bring the bicycle inside your house or apartment. And the new mirrors Velcro™ strap enables the mirror to be adjusted *without* a wrench, every time you hit a bump in the road. That’s good , because a wrench can easily slip and hit the mirror and break the glass. The new mirrors also are slightly convex, to give a wide field of view. I feel that a Rear View Mirror makes it impossible for a motorist to startle a Bicyclist who uses one. Anyway, what motorists need to pull out of this news story is that the Bicyclists are going too fast to stop if a car door opens in front of them. At 5mph, I can ride in the “door zone”, and stop in time if a car door opens. At 20mph, I have to rely on the Aerodynamic Fairing, or handlebar basket, to absorb the impact with the car door. This is an excellent way to move people out of the “door zone”, which really is not useable space, so defining a bike lane as six feet wide when it is flush to parked cars is disingenuous at best. That said, this design seems to run directly into the “fear from the rear”, which seems to be, at least on the surface, supported by the LAB’s recent study of bicycling fatal crashes, where something like 40% were rear end hits. I still wonder whether the problem is bicyclist placement or driver inattention. Also, how many were midblock vs. intersection, etc. In either case, I’d love to see some data at least two to three years down the road with this design to see the distribution of crashes, and their lethality. Thank you for the great article, Mr. Vance. Doing so creates a situation where the cyclist is invisible to motorists and more vulnerable at curbcuts and intersections, where the cyclist is suddenly in the path of a turning vehicle. It also makes it difficult for the cyclist to make a left turn. However, what still remains is that you can’t necessarily tell aldermen how to spend their discretionary money, when they use it to fund lots of different things in their ward. And many times they go… humm will put it on our list for next year and next year rolls around after a hard winter and the voters in their ward want pot holes fixed or there is an emergency sewer fix needed because of flooding. Which brings you back to there is no formalized plan in place, so what you will get are spankin’ new bike lanes and traffic patterns for autos that will slowly disappear. A lot of aldermen haven’t put into place the necessary crowdsourcing and volunteer network to actually KNOW when various markings have worn off of all the streets of their wards, either. I agree, this should be CDOT’s game, and citywide, and paid for with a yearly line-item. Daylighting intersections, also daylighting plus installing yield markings and speed controls at driveways solves one set of problems. Left turns mid-block will be an issue, but of course the bicyclist can always ride in the traffic lane to effect such a turn if they can’t bear to ride the extra few hundred feet to an intersection to make a box turn. In the end, though, getting bicycles away from moving traffic via a protected lane is a far better trade-off, as getting struck from behind represents 40% of all bicyclist fatalities and dooring as we all know is a major problem. Well since the decrepit state of crosswalks, especially at non signalized intersections is any example of things to come, don’t expect much. Any of the things I’ve suggested would be city-council level policy changes, so “what has happened the last two years” would no longer obtain if the policy were, y’know, changed. In an area with lots of curbcuts, “daylighting” essentially means losing a lot of parking and I suspect visibility is a lot more important than pavement colors or speed controls at driveways (how?). As Steven Vance points out, loss of parking often creates a lot of pushback from residents. Not that I agree that the public at large ought to pay for free car storage on public roads, but that seems to be the third rail of the discussion. Here is a video of how to slow cars crossing cyclepaths. I’ve seen and used a number of bike lanes that are inside of the parking lane, and the problem has always been the same. Instead of cars using the bike lane, you have pedestrians, strollers, skateboarders, shopping carts, children, dogs and so on. It effectively becomes an extension of the sidewalk. And I confess myself to walking on the Valenica Street bike lane when the sidewalk is so crowded it’s easier to just walk along the bike lane. Bad but true. Now, that’s all less dangerous than having cars in the bike lane, but it’s certainly no nirvana either. This is a solvable problem; see the 7th & 8th Avenue bike lanes in NYC. Where left turns across the bike lanes are permissable, parking is eliminated toward the block end, with a “left swerve” lane clearly marked for left-turning cars that makes cars making a left turn very visible to cyclists, with a left-turn light cycle for cars. In SF, there’s rarely a marked buffer zone; there are, however, painted “T”s along the parking lane that show the (expected) intrusion of car doors into the bike lane. It’s probably not a better solution, but it is helpful; I certainly noted and took care, at least once I understood what these odd “T” markings meant. with a left-turn light cycle for cars. That’s the best design I’ve seen for fixing the conflict that edge lanes/paths create with driveways. I’m honestly impressed. Those curbs will slow a car right down and thus give them time to look where they’re going and stop if they need to. I make sure to track my wheels at least 6 feet from parked cars. This puts my handlebars 5 feet away, giving me 1 foot of startle room from a 4-foot door opening. This instructional video will convince you why that’s necessary. On a street with a door zone bike lane, biking a safe distance away from parked cars means I’m squarely in the normal traffic lane. That’s often the safest place to be anyway, but since I get harassed by motorists for not being “in my place” if they see an unused bike lane, I end up avoiding those streets in favor of ones with sharrows or no additional markings. So, these buffers are an excellent idea! They just need to be 6-foot buffers, not 2-foot. The lane as painted should meaningfully designate a safe place to drive. The entire width of a bike lane should be useable; if it’s not useable space, it shouldn’t count as part of the bike lane. Relatedly, in order for a large vehicle in the center of a traffic lane to pass a bicycle in the center of a bike lane with 3 feet of clearance (the legal minimum passing distance in many states), the total width of the traffic lane + bike lane needs to be 17 feet. That can be a 12-foot traffic lane with a 5-foot bike lane, a 10-foot traffic lane with a 7-foot bike lane, etc. Dividing up a road into a 10-foot traffic lane and a 4-foot bike lane, while legal, is asking for rear-end collisions during failed passes. Preston Tyree is an excellent instructor. In Seattle, we are reasonably polite and adaptable. Instead of changing the infrastructure, we change our bodies, clothes and handlebars. With our 5 foot wide bike lanes and 4 foot door zones, that leaves only one foot for people on bikes. So, we just get really skinny, wear tight jeans and cut our handlebars down to 12 inches. With practice, pulling in the knees, elbows and shoulders becomes normal. Given our miniscule percentage of transport budget for protected bike lanes, it would be silly to wait in order to get around by bike, so we adapted and created a new fashion trend. Lets not be cranky now. A key benefit of these door-zone markings is that they signal to drivers why part of my body is to the left of the bike lane. Experience shows that many drivers give a narrower passing clearance to cyclists who do not “deserve it” and Maryland law even allows drivers to pass cyclists who stray from the bike lane a narrower passing clearance. The rude and impatient motorists are engaging in a counter-productive effort. They want to move faster, but that requires the cyclists to move closer to the doors of the parked cars (i.e. the Door Zone). In turn , the cyclists are going to be forced to ride SLOWER, in the event a car door opens, to be able to stop in time. Me personally , I have handlebar baskets on my bikes, which can absorb some impact if a car door opens in my path. My handlebar baskets are made of soft plastic, such as polypropylene, and polyethylene, and may be styled to look like a motorcycle windshield (known as an “Aerodynamic Fairing”) with amber marker lights on it. The instructor in the video does not point out the potential for severe injury by riding further out in the roadway in front of the much greater mass and speed of motor vehicles. Focusing just on how to eliminate the chance of a parked car door from hitting you and overlooking the increased opportunity for a driver of a fast moving motor vehicle to hit you by riding directly in their path is not a balanced look at the trade offs involved. Requiring this amount of roadway space for bike lanes as a minimum would severely limit the number of bike lanes that could be installed. Reducing the miles of bike lanes available would reduce the amount of people willing to ride a bicycle on a major road. Very few people are tolerant enough of traffic to ride a bicycle in front of motor vehicles on a major road. Forcing them to go to a reeducation camp has not been shown to have a significant impact in the number of people willing to ride in the middle of a motor vehicle lane on a major road. Separating people from danger is a basic tenet of industrial safety. The importance of separating cyclists from fast and heavy motor vehicles seems obvious due to their vulnerability and their large speed and mass difference from motor traffic. Getting the greatest amount of people bicycling with the resources available is what’s most important to me. Those cities with the largest proportion of the population cycling are also the cities with lowest fatality rates for cyclists. Trying to get people to ride in front of motor vehicles has the least potential for a significant increase in the volume of cyclists. Putting sharrows at least twelve feet out from the curb on a busy street is very ineffective in convincing bicyclists to ride there. Chicago has buffered bike lanes comprising at least four designs. The first was on Wabash Avenue and had two thick white lines on either side of the bike lane (the same width apart from each other) without hatch lines. Then there is the kind with a two-foot buffer on the LEFT side (toward the middle of the road) and little hatch markings on the right side that act like visual “spikes” to encourage people to ride away (although I personally don’t think these are sufficient to do what the study suggests and they weren’t considered in the study). Thirdly there’s the kind with a two-foot buffer on the RIGHT side (parking side) and hatch markings within the buffer that extend between both stripes on the right side. Fourthly, there’s the kind with a two-foot buffer on both sides each with hatch markings within the buffer that extend between both stripes on each side. This is the same as the first except with the addition of hatch markings. There’s a differentiation within the consideration of risk which requires one to estimate the probability of collision with the severity of collision. The severity of collision with a fast-moving automobile will almost always be great. However, risk of collision is greatly reduced with high visibility. Visibility in cycling comes via choice of colors, lighting, reflectivity, and lane position. The farther to the right in your lane position, the less likely you are to be noticed. The more central to the lane you ride, the more likely you are to get noticed. Thus, is can be asserted rather strongly that the potential for severe injury does not increase with a more central lane position. It gets you out of the door zone and makes you more visible to approaching motorists. The article doesn’t discuss sharrows either. The fact is that far more moving motor vehicles hit other moving motor vehicles than they do parked vehicles on the side of the road. Moving vehicles tend to hit what’s in front of them far more than what is beside them. Driver error is a great part of why collisions occur. Putting yourself in front of a moving motor vehicle does not eliminate driver error. You aren’t actually controlling the lane, the drivers are controlling their cars pedals and steering and not you. By positioning yourself directly in front of moving motor vehicles your giving the drivers an opportunity to hit you and you are depending on them to not do that. There tends to be a great speed difference between a turning car and one that is going straight. The focus of vehicular cyclists is on the risk of getting hit by the much slower speed of turning vehicles or parked car doors and not on the much greater risk of severe injury or fatality from vehicles going straight. The assumption on your part is that drivers going straight will notice you and take evasive action. Most drivers do not expect something in their way that is going at a much slower rate of speed. If a driver is not paying attention when moving straight, an impact with a bicyclist could result in severe injury if the person is hit with enough force. This is something that most people are intuitively aware of and so therefore they avoid riding a bicycle in front of vehicles on a street with fast moving moving vehicles. I’m in favor of “floating” parking lanes and placing the bike lane between the parked cars and the sidewalk, with or without a painted buffer. I would assume (but can’t support) that the passenger side doors are used less; but if a bicyclist does hit a door, at least they are not going down next to moving traffic. Any thoughts on this? If Chicago has some 4′ bike lanes and bicyclists need to ride at least 4′ from parked cars (which I agree is a minimum), I don’t see any safe way for bicyclists to ride in these lanes. Are bicyclists supposed to walk their bicycles in these lanes to avoid dooring? Are the bike lanes in Chicago legally mandatory? Even if they’re not, I’ve found motorists in other cities become far more hostile if bicyclists don’t use bike lanes after they are installed. I’ve found this even if there are cars parked in the bike lane, the bike lane ends, the bicyclist wants to turn left, ….. – none of these are excuses to many motorists. I like floating parking lanes, but the must have a full 4′ buffer. The passenger does not have a rear view mirror to look in and is not accustomed to checking for traffic. After being doored in a bike lane yesterday, I will always take a full lane over an unbuffered “dooring” lane next to parked cars. Every time CDOT says they’re going to build a conventional bike lane, you should send a complaint to them and the alder for that ward. We all should do that. This should be the end of “dooring” bike lanes. Striping all bike lanes in a way that encourages cyclists to ride out of the "door zone" would help keep people out of harm's way.